Your comfort is our #1 priority. At Dental Care Associates of Waycross, we always want you to be completely comfortable in our care. Dr. Keith Crummey offers Oral Conscious Sedation as an option to ease the treatment process and alleviate anxiety about your dental visit. Dr. Keith Crummey is a member of DOCS, Dental Organization for Conscious Sedation™, and has received training in dental oral conscious sedation protocols. Sedation dentistry can allow patients to receive the care they need in fewer appointments, while in a fully relaxed state. Prescribed sedatives are taken orally the morning of your appointment to put you in a completely relaxed state. We will make you comfortable in our treatment area and perform the procedure(s) while you are sedated. You will be awake and able to communicate, but will not likely remember much about the experience later, as the medication can have an amnesic effect. You will be closely monitored before, during and after your treatment to ensure the procedure goes smoothly. We ask that a companion drive you to and from our office, and recommend they stay with you until you have completely recovered from the effects of the sedative. 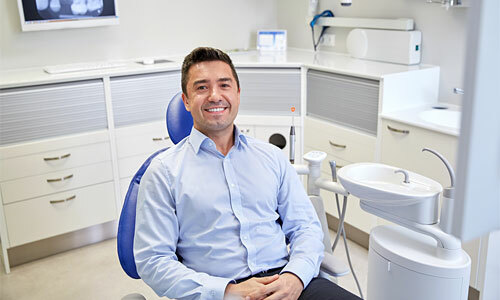 If you are in need of extensive dental treatment, or experience a high level of anxiety during dental procedures, sedation dentistry options can help you overcome the obstacles in your path leading to better dental health. Contact us for more information about sedation dentistry.